The first hack I'll cover is a couple of fans, in particular, I'd like to cover the HD fan. Because hard drives as a general rule are getting larger and faster (an average drive is now 7200RPM and holds 9gigs), there's a great deal more heat to deal with. Back when this machine was first created, the average drive was 500MB and ran at 4400RPM. If I want to put a higher capacity drive internally, I need a way to keep the drive cool, as heat from the drive will kill both the drive and the machine around it. The biggest disadvantage to the lunchbox chassis is it's inability to deal well with heat -- because it's so small heat has no place to go, and builds up easily inside the unit. 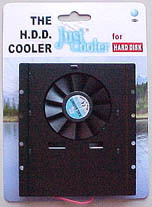 A device that caught my eye was the The HD Cooler, made by Cyber Cooler Inc.. 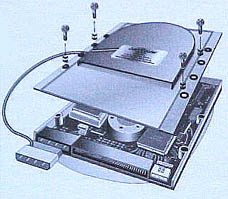 This flat fan attaches to the underside of a drive and draws air across the electronics side of the drive (as shown in the illustration to the right). I figured it would be easy to bolt this onto my drive and keep it cool inside the IPX. Well, this wasn't going to be as easy as I had thought. To start, I needed the right "top" to the Lunchbox machine. Sun made two different types, one that holds the drive from the bottom mount screws and one that holds the drive from the side mount screws. 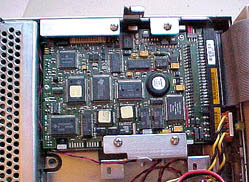 In this case, the side mount screws are preferable, as we want a good connection between the drive and the fan in order for it to do it's job effectively. If you are using the kind of top shown to the right, chances are this won't work for you. The problem is twofold. If you mount the fan on top of the steel, there's not a good "seal" between the fan and the drive, so the fan becomes somewhat ineffective. If you mount the fan below the steel mount points, the fan and drive may not have enough room to fit. You can try this, just make sure the exhaust of the fan points toward the powersupply and not the plastic of the case, or again, the heat will have nowhere to go. Next problem to think about is the RAM. As you can see from the image I've posted here, if you use the standard RAM that may have come with the IPX, it will be too "tall" to provide adequate clearance to close the case once the fan is screwed into place. I needed to search around for "low profile" 36bit SIMMs. Finding just the right RAM was the biggest headache in this project. With the new RAM in place, there's about 2 millimeters of clearance between the fan and the RAM. You'll need to squeeze the SCSI ribbon cable a bit, or push it into the frontmost portion of the case, ahead of the ram, so the RAM has even that tiny room to "breathe". 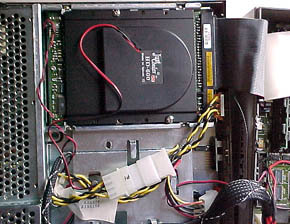 So, with everything secured and done, this is the drive fan mounted on the drive itself. Hopefully, this will allow a higher capacity, faster (and therefore hotter) drive to co-exist peacefully in an IPX. 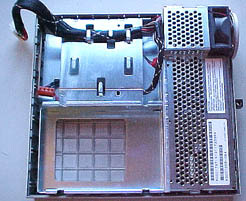 Note that the fan blows into the power supply, allowing the heat to be removed by the power supply's fan. I should also stress that I always remove the floppy from any Lunchbox system I work on. This gives me the room I need for my extra wires, and it gives the heat someplace to go. While this hack will probably work with the floppy in, I recommend that you be more careful, as a higher capacity drive, and the fan needed to cool it, places greater stress on the power supply. If there are any parts you aren't using in the IPX, such as the floppy or some useless SBUS card, get rid of it. Otherwise you are risking an early death for the power supply.